Notre Dame Jr/Sr High School's Navy Junior ROTC unit finished first at the JROTC Area 4 Regional Academic, Athletic and Drill Competition hosted by Proctor High School on Jan. 27. The Jugglers beat 10 JROTC units from around the region and other service branches during the competition and captured the regional title. They were also awarded the All-Service Championship. The competition included personnel inspections, color guard and drill competitions, athletic events, and academic testing. 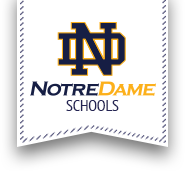 Notre Dame will represent Area 4 at the NJROTC national competition in Pensacola, Florida, this April. This is the first trip for the unit in its 45-year history. To support this trip American Legion Post 229 Commander, Jim George, presented a check to Cadet Company Commander Sarah Snyder on Feb. 2. NJROTC is a citizenship development program that instills in high school students and in U.S. secondary educational institutions the value of citizenship and service to the United States. In addition to classroom instruction, cadets participate in a number of extracurricular activities throughout the school year as well as the summer months designed to stimulate learning by hands-on experiences and to reinforce the program's curriculum. Cadet extracurricular activities include community service projects, drill competitions, academic competitions, cybersecurity, and visits to naval installations. Notre Dame’s NJROTC program is currently under the direction of LT Terry LaBeff, Chief Brian Jaynes, C/LCDR S. Snyder, C/LT C. Cramer, and C/Command Master Chief R. Ceiplenski.